Sailing Lake Sunapee at a speed of 50 mph. The rain on Monday has resurfaced the big NH lakes, and fast ice will be the rule of the day this weekend on Sunapee. As we train for the Ice and Snow Sailing World Championships this year- the 30th-we will have our minds on what it will be like in Saguenay, Quebec, site of this year’s event. The conditions on the lake this weekend will be similar to those encountered at last year’s WC in Riga, Latvia. Fast, and unforgiving for those who do not wax carefully. I may use blades from the Nordic Skater, a great local resource in nearby Norwich, VT, just across the bridge from Dartmouth. With blades [assuming that they are high enough to escape the drag on new snow] wax is not a factor. Thursday’s predicted snow will tell the tale. In any case, as the WC draws closer the U.S. Team will assemble on Sunapee and continue training. The WISSA racing rules are certainly simple, but also rather thin. The IKA, the Kite Class branch of the ISAF, have published the Experimental Kiteboard Competition Rules. 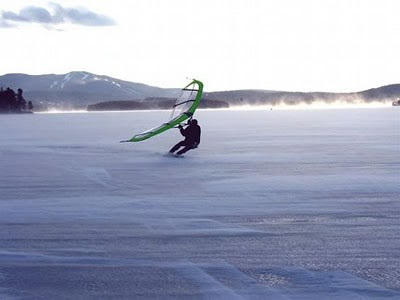 They apply quite well to snowkite races, with one or two minor modifications. Have you guys contemplated to use those?